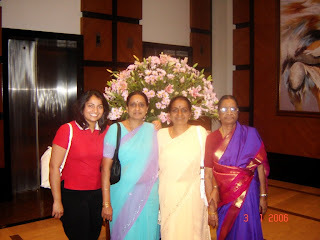 Today is my mother's second death anniversary - is it so long since Amma hasn't been around? Can't believe - because she keeps coming to mind ever so often! She had her idiosyncrasies, alright. Who doesn’t? Looking back, they seem trivial in comparison to all her positive traits. In fact I am proud to admit that I have imperceptibly imbibed some of them. Amma’s most admirable trait was her total honesty. She was true to her conscience and so never hesitated to wear her heart on her sleeve and was never afraid of anyone. I remember I was scared of her as a kid – why, even after marriage! I’m glad about that as it has helped in moulding my personality! I learnt that if she would not approve of something, I was in the wrong. It was as simple as that – I had a very dependable touchstone – but I wasn’t aware of it then! I learnt to be conscientious like her but not outspoken. Another trait I’ve imbibed from Amma is her sense of fairness and equal distribution. It was apparent even in day-to-day trivialities. Don’t laugh – take the instance of dessert-sharing at home - if mangoes were cut and offered on a large common plate for everyone to dig into – the smarter and faster ones would get a greater share. Amma would never allow that. She would neatly peel (she loved to do it) some half a dozen mangoes as we’d patiently sit around and wait and watch. Each mango would then be cut into equal-sized pieces and carefully divided into five equal parts. This would be repeated with all the mangoes. Each of us would get a mound of those pieces on separate plates – this way every one of us would get an equal taste of every mango. A small incident but enough to instill fairness and justice and also the habit of sharing in us kids. Amma knew the value of hard-earned money and would never part with an extra rupee unnecessarily. She’d bargain with everyone – right from the vegetable vendor to the jeweler and emerge winner at the end. We’d be secretly happy with the outcome but couldn’t condone the waste of time and energy. I also don’t let myself be taken for a ride by shopkeepers / vendors but expend every penny judiciously with the typical middleclass mentality. I am happy to admit that I too am ‘money-savvy’ – no, no, not in the way you imagine – I don’t go in for stocks and shares for greater returns but manage my funds in the most conservative way – like my parents, I believe it is better to be safe than sorry! I believe in conserving money without affecting the quality of life. Amma was the daughter, daughter-in-law, wife and mother-in-law - of civil engineers. So her interest in the construction aspect of house/apartment was natural. For the housewife that she was, it was surprising to listen to her discussing the ‘built-in area of a flat or dimensions of each room. Out of the blue, she would ask, “What’s the size of your master bedroom?” and I’d be groping for an answer. The height was when we had all gone flat-hunting for her and she posed the question, “What’s the size of this room?” Embarrassed, we curtly told her, “You can see it, ma, how big it is.” But she insisted on the blueprint of the flat – we found it funny then but she did have a point there – she needed to study it carefully and make a thorough analysis before taking the plunge. This speaks volumes about her caution. Amma was the Home minister, Finance minister, External affairs minister… All rolled into one. Her excellent sense of economy and judiciousness reflected very well in the family’s budget. With her careful planning, she had managed to get ready all the gold jewellery for the wedding of her two daughters well in advance. She held on to our baby-jewels (gifted by both sets of grandparents) and passed some of them on to my children – even to my granddaughter as heirloom. Well, I feel proud to see my granddaughter wear the ear rings her grandma had worn as a kid – the ones which had been originally gifted to her by her grandmother and which were gifted to the little girl by her great grandmother during their first and last meeting! (Confusing? Rack your brains…). This is just one of the half-a-dozen such jewels that had come from both sets of my grandparents to me when I was little, which came from Amma to my kids and have now gone from me to my grandkids – traversing 5 generations, thanks to Amma! Didn’t I say some of her traits have rubbed on to me? She had even preserved the lovely frock-sweater she had knitted lovingly for me. Unfortunately it couldn’t be put to good use as she didn’t have a granddaughter! Well, I couldn’t preserve it – for my granddaughter! But my grandson does sport the smart kid-sweater I had knitted for my son and looks his exact replica! I admired Amma’s zest and passion for life even in her seventies! She loved to buy as well as wear synthetic saris as well as Kancheepurams and silk cottons. The more you have, the greater the difficulty in maintaining them! But it was a pleasure for her to stack them neatly. Even as kids we had to help her fold the sari – holding one end of it as she folded from the other end. I kept up this practice – no, not with my kids but with my husband. Now he has become an excellent sari-folder! Amma had ‘tasty fingers’ – whatever she prepared tasted great. She was very particular about festivals and meticulously prepared delicacies. But she wanted us girls to hang around in the kitchen and be at her beck and call to hand her this and that during the snack-preparation. Though my sister and I were clueless then as to why she wanted us to be her robots, over the years we have realized that we have picked up our culinary skills the right way – by observation and actual practice and not from cookbooks. We can boast of preparing all those sweets from ‘laddoos’ to ‘jangiris’ and ‘kozhakkattai’ to ‘elai adai’ and snacks, savories, ‘vathal’, and ‘vadaam’. We would puff up with pride when Amma in her later years complimented our cooking – it was akin to Vashishta Muni giving the title of ‘Brahmarishi’. I would be on cloud nine when she sought my handy hints and cooking tips with a kid’s eagerness. Amma had great interest in music – she had learnt Carnatic music – vocal as well as veena. As a youngster, I would sing Tamil and Hindi film songs and Amma would appreciate them. Till her end, she remained my fan – perhaps my greatest – I would give her cassettes of my amateurishly sung and recorded songs and she would go into raptures listening to them! In fact she is my guru in a sense. Amma had always felt bad that I couldn’t get much formal training in classical music due to my father’s frequent transfers. She turned my guru and insisted in teaching me some ‘keethanams’ in preparation for marriage alliance. I remember my brother rushing out with the SOS, “Hold on! Start your ‘sa, pa, sa’ after I go out! Bye! !” I had grown up listening to her favorite numbers – ‘vaasudeva yani..’, ‘paraamuga mela..’, ‘jaga janani..’, ‘thaye yashoda..’, ‘teeraada vilayaattu..’, ‘vallabhaa..’ and so they came easily to me. In her later years, her eagerness to sing during functions and festivals remained unabated but since she couldn’t reach the high notes, she’d coax me to join her – and I’d become ‘Radha to her MS’ (just a hyperbole, not audacity). Amma would sit through hours of music and dance on TV – all I had to do was, give her a call about the special program going on - she’d be all excited. At times, she’d call me to say Chitra was singing on Asianet! I’m sure the channel’s TRP must have been affected after she was gone! Amma enjoyed family functions and weddings – she was easily the best-dressed senior citizen around. With my sister’s son’s marriage round the corner, we all feel her absence very much. I remember how proud and happy Amma and Appa were at the weddings of my sons. I can imagine the proud grandparents in all their glory showering their blessings from heaven!